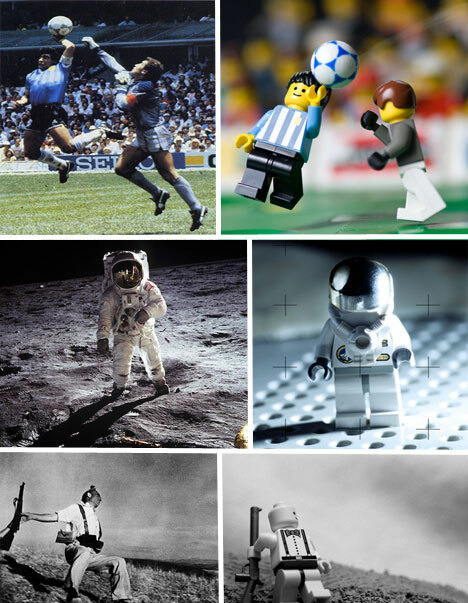 We have Ole Kirk Christiansen, a carpenter from Billund, Denmark, to thank for creating the first Lego block in 1932. If it were not for Christiansen’s skill and imagination, the world would have missed out on enjoying the fabulous Lego creations we see today. 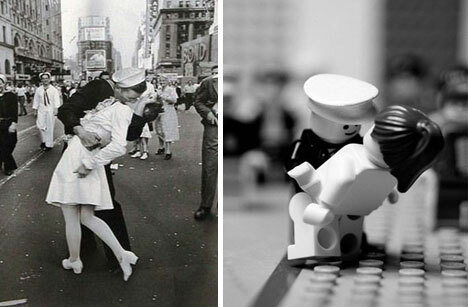 Legos were wooden until 1940, when the company began also producing them in plastic. 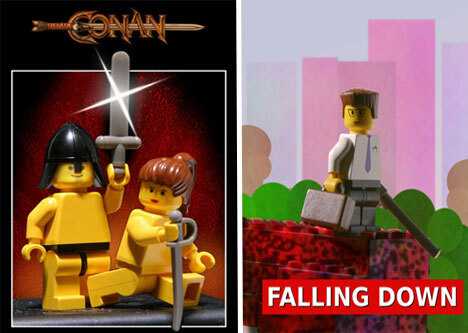 The love of Legos has endured the test of time and these toys have fans of all ages around the world. 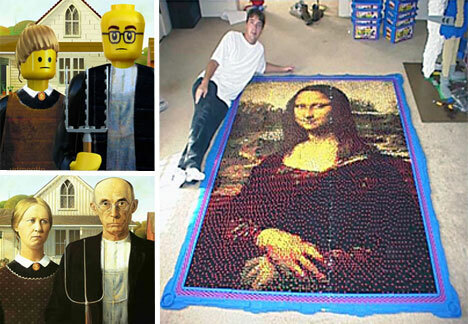 These popular and versatile toys have also become an artistic medium. 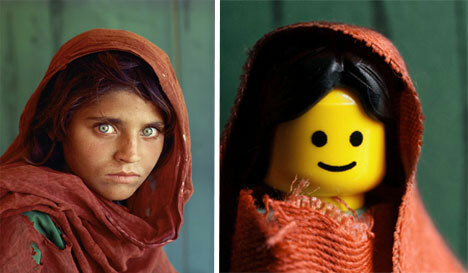 Aside from creating amazing original works of art, artists have also recreated famous artwork using Lego blocks. It is always interesting to see a new spin on an old classic. 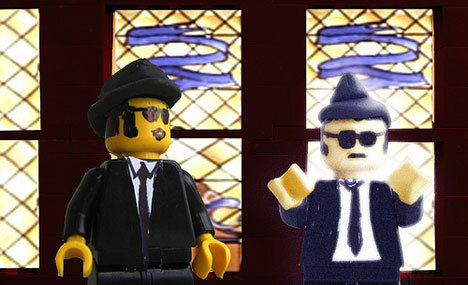 Even in Lego form, Edward Hopper’s Nighthawks emanates an air of loneliness an desolation. 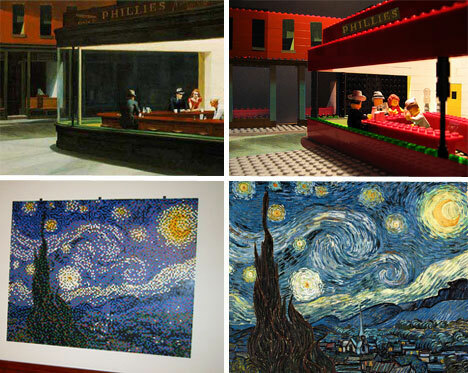 The mood of The Starry Night by Vincent Van Gogh is also, surprisingly enough conveyed through the Lego reproduction. 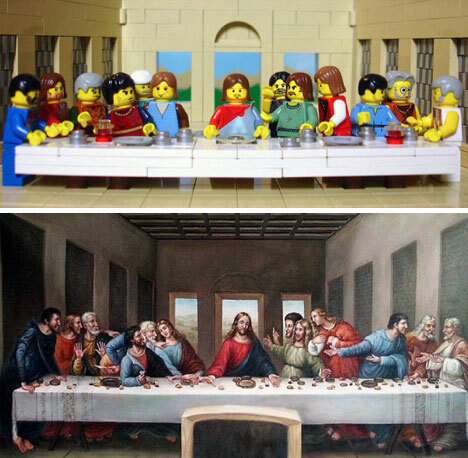 Other classic works of art have also been beautifully reproduced in Legos, including Leonardo da Vinci’s Mona Lisa and The Last Supper and Grant Wood’s American Gothic. The Taj Mahal is an amazing work of art in itself. 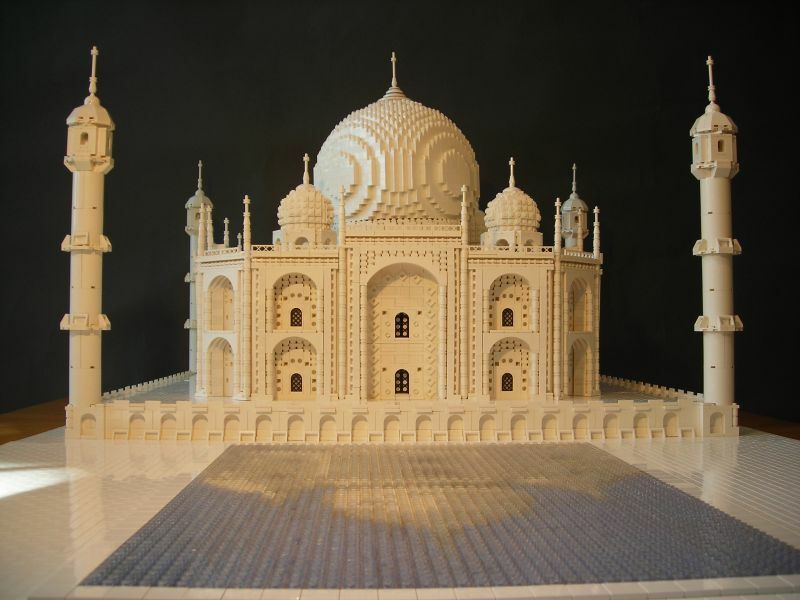 A replica of this grand and universally admired structure was recreated in Legos and was a masterpiece. 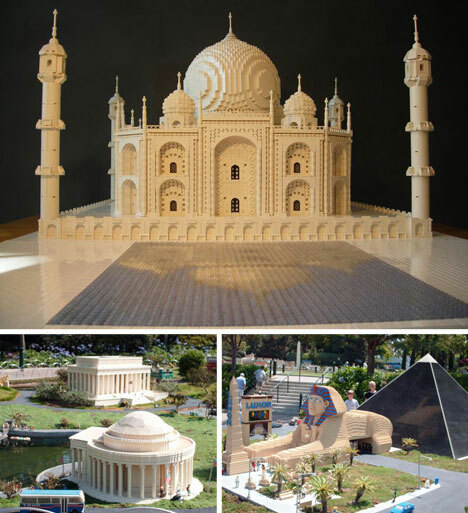 Models of other famous buildings and structures have also been built from Legos, such as Washington D.C. landmarks and the Luxor Hotel in Las Vegas. 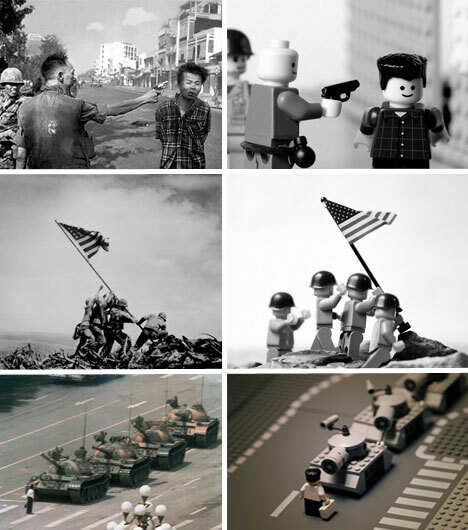 Mike Stimpson is a photographer and artist who enjoys taking his own amazing pictures and recreating famous pictures with Legos. He has recreated the photo of the child who became universally known as “The Afghan Girl” after she appeared on the cover of National Geographic, the famous WWII Navy photo, “The Kiss,” the first moonwalk and many others. 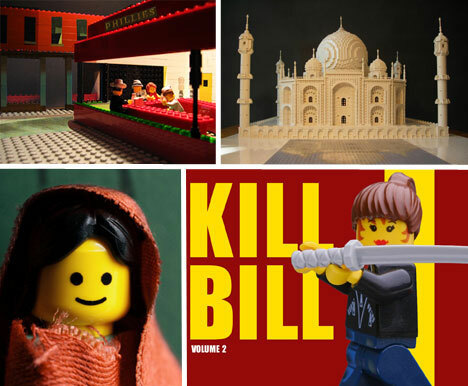 DVD covers, CD covers and scenes from favorite movies have also been recreated using Legos. The effect is humorous and playful yet still remarkably good. 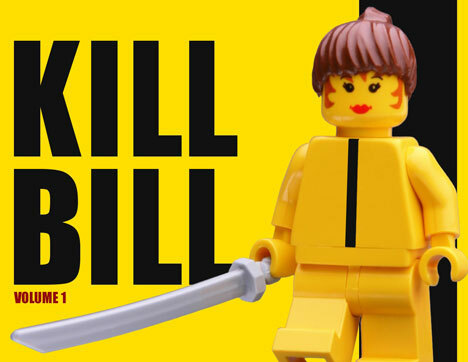 The Lego Kill Bill DVD covers are particularly stunning and seem to capture the expression of the original artwork, with an added smirk. 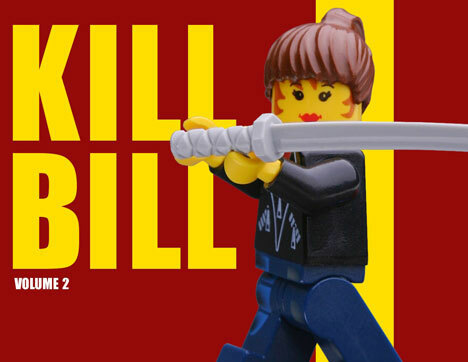 As you can imagine, at the Lego theme parks, all things are Lego. Mt. 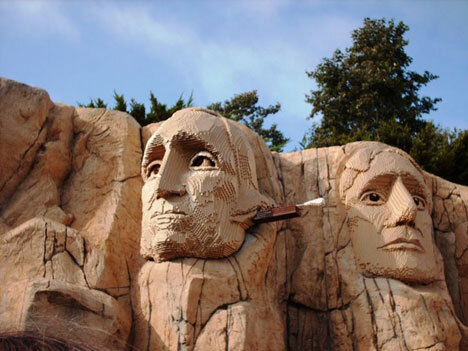 Rushmore is an amazing example of what Legos can do. 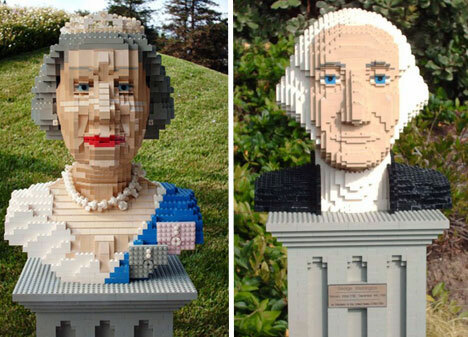 The busts in the likenesses of The Queen and George Washington give us a humorous look at the versatility of Legos. 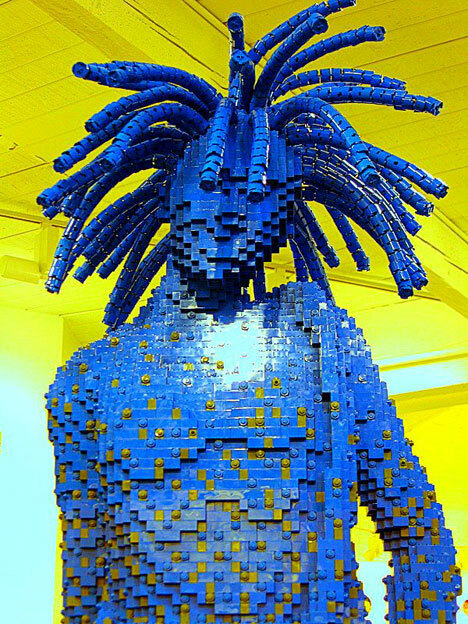 The Hydra Lego sculpture resides at the Lego Pavilion at Disney in Orlando, Florida and is made of over 15,000 Lego blocks.